Just because it is autumn doesn’t mean abandoning the healthy and nutritious salad. Let’s incorporate the flavors and bounty of autumn into our salad, which will be a welcome change. Butternut squash and cranberry orange cherry sauce top this salad. 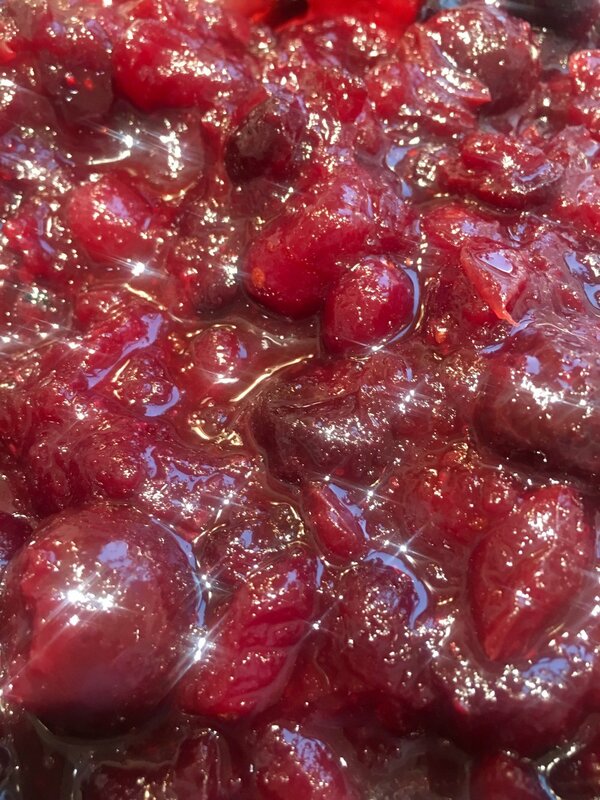 The gourmet goddess made the cranberry sauce last week, but now will take it a step further. Beautiful flower-like slices of roasted acorn squash filled with cranberry sauce embellish the pinnacle of this salad. Add apples, glazed walnuts and blue cheese, then drizzle with a Maple Orange Vinaigrette. Recipes for the Maple Orange Vinaigrette, Roasted Acorn Squash, Cranberry Orange Cherry Sauce and Salad are all included below. This salad makes a great appetizer for Thanksgiving or the roasted acorn squash with cranberry sauce can be served as a side as well. Dressing can be prepared up to 2 days ahead. Whisk together all ingredients. Dressing can also be prepared in a blender. Combine cranberries, 4 cups of sugar (reserve 2 cups of sugar for next step), water and orange juice. Bring to a simmer on medium heat. Cook for about 7 – 10 minutes. Add defrosted cherries, the other 2 cups of sugar, dried cranberries, dried cherries, cinnamon, orange zest and ground cloves and cook on medium low heat for an additional 10 minutes stirring occasionally. Can be washed, dried and sliced a day ahead. Store wrapped well or in an airtight container. Place parchment on cookie sheets and lay out acorn squash. Melt butter and add olive oil, brown sugar, salt, cinnamon and nutmeg and stir ingredients together until brown sugar is melted. Brush the top of each acorn slice and bake for 25 – 30 minutes or until tender. Can be served warm or chilled. Add sliced red onions, apple slices, glazed nuts, blue cheese crumble. Top with warm or chilled acorn squash. Fill center of squash with cranberry orange cherry sauce.